The entire Western financial systemic, complete with USDollar-based foundation platforms, is breaking down. The breakdown is in full view, very noticeable, in almost every arena. What happened in 2008 with the Lehman Brothers failure event is currently underway with almost every single financial platform, structural entity, financial market, banking structure, and arena. In response to the Lehman killjob event, where JPMorgan and Goldman Sachs strangled the victim firm (by denying Lehman proceeds on countless asset sales), the entire Western financial system has been lashed together, tied together, and connected among its many member parts. The main parts are the big banks, which use derivative contracts to lash themselves together. They believe there is strength in numbers, which is true to some extent. But the consequence turns out to be that all will fail at the same time in a cascade of insolvent marred by illiquidity while steeped in corruption and market rigging. The breakdown could be described as having begun in full force, in earnest power, at the start of this 2016 year. This is the year of systemic failure, or financial breakdown, and of revelations of important crimes for the last generation or more. The revelations are against the Western power centers for their grand criminal activities. The East, by favoring a Gold Standard, has put the West on notice for exposure, if not prosecution. The gold weapon has power in its arbiter role in commerce, banking, and economies. No nation will be spared from the urgent nasty effects of being forced to achieve trade balance. Bill Holter issued red alert warning: this is your last chance! Extreme distress and disruption is coming to the united states economy, businesses, politics, society, and community affairs. Bill Holter is associated with JSMineset, alongside Jim Sinclair. He is formerly from Miles Franklin, where he might have become too controversial in his very appropriate but unconventional views. Holter offers an extreme warning for people of the United States, that a series of nasty events is coming. Holter warns that the events will be so disruptive and historical without precedent, that recovery will be extremely difficult without proper preparation. This warning is the latest in a long string of such detailed specific warnings, as a result of the systemic breakdown and urgent official actions to come. The Jackass agrees with 97% of his message, a true red alert warning. A shocking $100 billion in Glencore debt has emerged, linked to commodity derivatives. The next Lehman has been spotted in the commodity trading arena, if not the gold mining sector. Similar exposure is cited for other large players, to reveal a potential half $trillion hole in energy finance. The global financial crisis is set to endure a redux of Lehman in a systemic event, as commodity derivatives reveal a major hole in the financial picture. The huge gaps of insolvency have nothing to do with mining project shutdowns, except perhaps indirectly. They are more directly related to lower commodity prices, in an immediate effect. Bank of America has done an extensive analysis to break down Glencore's true gross exposure. Glencore PLC is an Anglo–Swiss multinational commodity trading and mining company headquartered in Baar Switzerland, with its registered office in Saint Helier Jersey Isle. Here is their conclusion. "We consider different approaches to Glencore's debt. Credit agencies such as Standard & Poors start with normal net debt, i.e. gross debt less cash and then deduct some share (80% in the case of S&P of RMIs, the Readily Marketable Inventories). These are considered to be cash-like inventories (working capital) in the marketing business. At the last results, RMIs were about US$17.7 billion. Giving full credit for RMIs plus a pro-forma for the equity raise and interim dividend, we derive a Glencore Adjusted Net Debt of about US$28 billion. On the other hand, from discussions with our banks team, we believe the banks industry (and ultimately regulators) may look at the number, i.e. gross lines available (even if undrawn) plus letters of credit with no credit for inventories held. On this basis, we estimate gross exposure (bonds, revolver, secured lending, letters of credit) at around $100bn. With bonds at around $36bn, this would still leave $64bn to the banks account (assuming they don't own bonds). Over US$100bn in estimated gross exposures to Glencore. We estimate the financial system's exposure to Glencore at over US$100bn, and believe a significant majority is unsecured. The group's strong reputation meant that the buildup of these exposures went largely without comment. However, the recent widening in GLEN debt spreads indicates the exposure is now coming into investor focus." Debt default comes very soon, complete with huge fallout effects and contagion within the energy sector. In other words, counting all exposure beyond ordinary debt, like derivative exposure, Glencore is mired in a $100bn hole. The Zero Hedge group of analysts is on the job, as always. They reported recently a change in the finance winds, making it more difficult to support the debt and other related exposure. Bond market spreads imply a non-investment grade rating. ZH reported the following. The group's bond spreads imply a rating in the single-B range and a rollover cost of funding over 200 basis points (bps) above the cost of debt outstanding. We believe banks have gross margins on their exposures that are below the Glencore group's average funding cost, with drawn financing at spreads around 50bps and undrawn lines materially below this. The cost of hedging exposure is currently over 600bps. Thus, the profit & loss (P&L) dynamics for banks are difficult. This implies that banks may increase the challenge for the business model of commodity traders. This implies that banks may increase the cost of and reduce the availability of credit to commodity traders, thus challenging their business model. TCK refers to Teck Resources, in deep shiitte. Ooops, errr, deep sneakers! Glencore is in red, in severe trouble also. One must recall that Glencore is a major commodity trading house, and not an active business with tangible product in its activity. The chart given has a mix of trading firms and mining firms. All are at tremendous risk of failure. Not only Glencore is cause for deep concern in bank exposure. Very likely the rest of the commodity trading space is in the same vulnerable position. Their combined gross exposure blows up to a simply stunning number. Among these unique firms, Glencore might not be the only exposure in the commodity trading space. Other entities such as Trafigura, Vitol, and Gunvor could become a new perceived risky feature on bank balance sheets as well. Think $100bn exposure, times four. A ripe half $trillion in very highly levered exposure to commodities is a very real prospect. The oil & gas price declines triggered this sector crisis. Bear in mind, the energy asset class has been crushed in the past year. 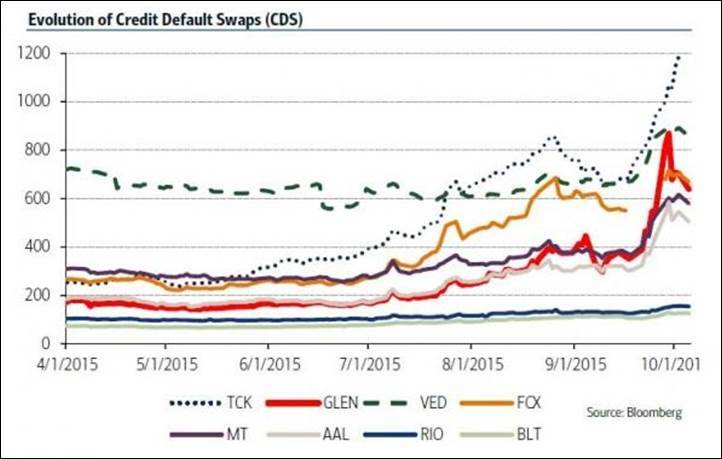 According to the derivative desks, the Glencore 5-year Credit Default Swap tightened by 85 bps in a recent single day to around 640 bps. Bank of America does some solid analysis. Here is their conclusion in summary. 1) Comparisons are being made with some financially leveraged companies during the 2008 Global Financial Crisis. 2) If credit is downgraded, banks could lower their exposure to Glencore. 3) The high yield market is small and therefore expect to see temporary dislocations in a scenario in which GLEN is downgraded to junk. 4) Bank stress tests could start to include commodity trader distress. This could lead to less credit availability and more expensive bank funding of traders. Credit to Zero Hedge for excellent analysis on an ongoing basis. One can combine the energy sector debt distress with the commodity derivative exposure, to see a systemic Lehman event on the near horizon. The many factors are lining up to force a systemic failure event, a massive financial crisis globally with numerous sectors in failure mode. The energy sector has been well detailed for its debt risk to the big banks. The legal prosecution with heavy fines and penalties remains a big risk in the mortgage sector. The Emerging Market debt exposure, triggered by both currency risk and economic decline, has also been well detailed. The market rigging cases grow by the month. Finally, with cases like Glencore, the commodity derivative risk has entered the picture. The Jackass has been recounting the risk and building the case for a major systemic Lehman type of event in the very near future. The destruction of the European Union is a project well along. It began with the Russian sanctions after the US & Israel worked their magic in orchestrating and engineering a coup d'etat in Kiev Ukraine. Thousands of amphetamine vials helped the event along, as did hired rooftop snipers, all funded by the US and EU darlings. The Western propaganda machinery immediately fulfilled their role in painting the Russians as villains, even though the Western Fascist Axis was responsible. The Kremlin was quick to rush in and to secure their naval port in the Crimea, a valuable Russian Naval facility. The local population voted over 95% in favor of being annexed by Russia, a major point omitted in the Western dutiful dog-like press. In recent months, it has been clear that the Kiev crew, led by Washington, have violated the Minsk Agreements, not the Russians. In recent months, some sordid human organ trafficking, complete with vast fields of organ-less cadavers, has been exposed for the Kiev Regime. For the USGovt to be closely associated with war criminals, human rights violaters, and perpetrators of mini-nuclear bomb events in the Western Ukraine region is abominable. Yet many mindless observers in the West continue to view Russia as the villain. They read the New York Times and watch CNN far too much, like robots with a sub-Bush IQ. The motive has been to cut off Russia from Western Europe with respect to energy supply, in particular with natural gas supply. The Washingon Neocon Neo-Nazis would prefer that Western Europe purchase more expensive natgas from the Gulf Region and Arab friends. The entire Syrian War is another blockade or cheaper natgas supply for the Western European Economy and its market. The Iranian Gas Pipeline would provide natgas even cheaper than Russian Gazprom, and the USGovt does not want that!! The USGovt, led by fascists and advocates of endless war, are working feverishly with war and sanctions and bank pressures and undermined coalitions and and contract bribery and heavy propaganda to prevent the unification via trade between Europe and Russia, and between Europe and Iran. They will fail on all fronts. The Eurasian Trade Zone, its economic union plus Silk Road, will continue to enjoy buildout and infra-structure projects on a vast scale. It will construct the Gold Standard in trade, banking, and currencies. Commerce will trump war. Gold will win. The saturation of Western Europe with Arab and Moslem refugees will be told as the most unique contamination event of the modern era. It matches the destruction of the Gulf of Mexico by Halliburton and the spread of Corexit chemicals. It matches the attack and ruin of Fukushima by the Bush Crime Family, after Japan began work with China on a regional currency. The radioactive contamination has reached the West Coast of the United States. It matches the widespread water table contamination by fracking projects, under the ruse of energy production. Gold Ole Halliburton got away with over one billion gallons of contaminated water dumping from fracking operations into the California water table, with the USGovt EPA nowhere to be seen. The refugees from North Africa and Syria are invited by the Western Govts. The first indication of foul play and vile motive was detected by the Jackass when questions arose on how the passage across the Mediterranean Sea was being paid. Poor people cannot pay for food, especially for ship passage. The Austrian Govt security agency confirmed it was largely via the Soros NGO groups. The stench of planned contamination at the social level was clear. The crime level, the fear level, and disorder level, have all increased. The effect on the Western European Economy has been clear, powerful, and devastating. Few people think in similar wavelengths. The dilution of their society, the rise in their crime level, the dissolution of their borders, and the ratcheting down of their economy, these are all critical elements toward establishment of the European Union fascist state. Lord Rothschild is pleased, enjoying the destruction in typical Satanist manner. In keeping with the dumping program on many fronts, Turkish leaders have been bribed into cooperating with the contamination. The $3 billion bribe paid to Erdogan was not to offset the costs incurred for accepting Moslem refugees. It was to send them to Europe, where EU member nations would be forced to absorb them without proper channels followed. Erdogan will enjoy his retirement soon, but it might be in a pine box. The likelihood of a Turkish Military coup rises with every passing week. Turkey plans to lift visa requirements for travel to the European Union, including Cyprus. Erdogan has provided a jet assist to the Moslem dumping into Europe. The plan is disruption and further economic degradation, along with a dilution of their society. Turkey has decided to lift visa requirements for all EU citizens, including Greek Cypriots. The move comes following a report stating that the European Commission will propose the easing of visa requirements for Turkey. Visa free travel for 28 EU member states was adopted by the Turkish cabinet recently, a decision published in the country's Official Gazette. Although visa requirement will be lifted for all Greeks in Cyprus, a Turkish official told Reuters that Ankara does not recognize Cyprus, a certain odd source of confusion. The gesture does mean the recognition of Cyprus. On the current status, Greek Cypriots can already travel to Turkey. Reuters had earlier reported, quoting sources close to the Brussels-Ankara negotiations, that the European Commission will propose easing visa requirements for Turkey. The reports come after Turkey threatened to back out of the landmark migrant deal. Reuters cited a diplomatic source as stating that Turkey's visa free demands will be met when the European Union's top executive body announces its proposal to ease visa requirements for Turkish citizens during an upcoming meeting (maybe past by now). Another source said that the committee's preparatory meeting already expressed support for the proposal. The European Commission is scheduled to issue an official report as to Turkey has met the benchmarks for visa free travel. An EU official speaking to Reuters claimed that Turkey has fulfilled as many as 65 requirements, meaning it doubled the number of satisfied conditions in less than two weeks. As of the end of April, the Turkish Govt had reportedly met less than half of the conditions required. In April, Ankara threatened to back out of the migration agreement with the EU, unless travel rules were relaxed for Turkish citizens when entering the 28-nation union. According to the deal, Ankara has promised to accept repatriated refugees from Greece with no EU entry permits, in exchange for sending the same number of vetted Syrian refugees. In return, Turkey would be given up to EUR 6 billion in European funding over the next five years. Furthermore, as a diplomatic reward, Turkey has brought to the table its desire for the EU to fast track its application to be included in the visa free Schengen zone travel as early as June. The EU has provisionally agreed to consider Turkey's bid, putting up a list of 72 conditions it must fulfill, including the use of sophisticated biometric passports and stricter border controls. The migration deal between Ankara and the EU went into effect on March 21st. Even though the EU seems eager to keep the deal with Turkey, the agreement has been highly criticized by human rights groups, who question whether Turkey is a safe place for migrants. Moreover, the human rights concerns have increased after Amnesty International revealed that Turkey has returned thousands of Syrian refugees to the war-torn country since mid-January. Also, Turkey has been accused of murdering numerous refugees at its borders. 5) to engage in numerous regional wars to support the USDollar. The New Scheiss Dollar will arrive in order to assure continued import supply to the USEconomy. It will be given a 30% devaluation out of the gate, then many more devaluations of similar variety. The New Dollar will fail all foreign and Eastern scrutiny. The USGovt will be forced to react to USTBill rejection at the ports. The US must accommodate with the New Scheiss Dollar in order to assure import supply, and to alleviate the many stalemates to come. The United States finds itself on the slippery slope that leads to the Third World, a Jackass forecast that has been presented since Lehman fell (better described as killed by JPM and GSax). The only apparent alternative is for the United States Govt to lease a large amount of gold bullion (like 10,000 tons) from China in order to properly launch a gold-backed currency. Doing so would open the gates for a generation of commercial colonization, but actual progress in returning capitalism to the United States. The cost would be supply shortages to the USEconomy, a result of enormous export increases to China. The colonization has already begun, with secret deals galore. It is very unclear what deals are being struck in order to arrange for the USGovt to have a proper gold reserve hoard, for backing a new legitimate USDollar. Meetings at very high level are in progress, with little if any popular representation, only elite members present. Failure to produce a legitimate bonafide gold-backed currency would mean the United States must proceed with the New Scheiss Dollar, an illegitimate fake phony farce of a currency. It would be subjected to a series of devaluations. The result would be heavy powerful painful price inflation from the import front. The effect would be to reverse a generation of exported inflation by the United States. The entire USEconomy would go into a downward spiral with higher prices, supply shortages, and social disorder. However, the rising prices would come from the currency crisis, and not so much from the hyper monetary inflation. That flood of $trillions has been effectively firewalled off. As Ron Paul has stated, one cannot blame capitalism for the current failure, since we have had almost none! He can take credit for the independent audit conducted on the US Federal Reserve itself in 2009. From the audit, it was learned that $23 trillion in near zero cost loans were granted to the USFed owners, by the banker cabal to itself. The US population remains largely asleep and steeped in ignorance on the entire financial crime scenes. They must prepare with reduced paper wealth held as assets, and more Gold & Silver bars & coins held instead as assets. The reckoning has begun. the seeking of equilibrium in Supply vs Demand in the new fair uninhibited market, with exclusive control removed from London and New York, and placed elsewhere like in Shanghai, Hong Kong, Dubai, and Singapore. the remedy toward owners of over 40,000 tons of rehypothecated and stolen gold in bullion banks across the world (primarily in Switzerland.